The Tamil National Alliance (TNA) which swept the Northern provincial polls with a four-fifth majority is now struggling to cope with the task of determining who and who shoul be appointed provincial ministers and council chairman of the Northern provincial council. It is also undecided yet on allocating one bonus seat while the other will be given to the Muslim candidate who contested on the TNA ticket and lost in Mannar. All twenty-eight elected provincial councillors met on Monday September 23rd in Jaffna and unanimously resolved that former supreme court judge Canagasabapathy Viswalingam Wigneswaran be appointed as the chief minister of the Northern province.Wigneswaran who was projected during elections as the chief minister won resoundingly with 132,255 preference votes. Finalising the provincial minister posts however has turned into a difficult exercise due to demands by the TNA constituent parties on the one hand and the necessity of satisfying various regional, religious, caste and gender based requests on the other. The TNA currently consists of five political parties namely the Ilankai Thamil Arasu Katchi (ITAK),Tamil United Liberation front (TULF), Eelam Peoples Revolutionary Liberation Front(EPRLF),Tamil Eelam Liberation Organization (TELO) and the Peoples Liberation Organization of Tamil Eelam (PLOTE). All parties contested as the TNA under the house symbol of the ITAK. The TNA polled 353,595 valid votes altogether in the Northern Provincial poll and obtained 30 including 2 bonus seats of the 38 seats in the Council. District wise the TNA break down is Jaffna-14;Kilinochchi-03;Mullaitheevu -04;Vavuniya-04 and Mannar -03. Those elected from the five districts are from all four constituent parties except the TULF whose nominees including ts leader Veerasingham Anandasangaree lost. The ITAK has returned the most number of winners but the other three party candidates have also won. Though CV Wigneswaran is of the ITAK all other constituents also endorsed him as the common chief ministerial candidate.The other constituents are now clamouring for one representative each to be accommodated on the four member board of ministers. EPRLF leader Premachandran alias Suresh is demanding a ministerial portfolio for his brother Sarveswaran who contested and won from Jaffna. Former TELO parliamentarian MK Sivajilingam who also won from Jaffna is staking a claim for a ministerial berth. ITAK secretary-general and TNA strong man “Mavai” Senathirajah wants his loyalist and former Jaffna municipal commissioner CVK Sivagnanam as an ITAK nominated nominee. Former MP and PLOTE leadr Dharmalingam Siddharthan who came third in Jaffna on the preference vote count is also a ministerial contender. Ananthi Sasitharan the sole woman member who got the second highest number of preferences is also being promoted as a ministerial hopeful by the pro- tiger lobby in Sri Lanka and Diaspora elements abroad. Ananthi is the wife of Sasitharan alias Ezhilan the former Trincomalee political commissar of the Liberation Tigers of Tamil Eelam(LTTE)who reportedly went missing after surrendering to the military in May 2009 at Mullaitheevu. Ananthi has who referred to herself as LTTE leader Ezhilan’s wife at election meetings evoked much sympathy by bursting into tears while speaking.Those promoting Ananthi for a ministerial post are cleverly using the “gender” claim by arguing very correctly that women outnumber men in the North and that the only woman councillor Ananthi should be accommodated. In addition to this there is the less talked about “caste” dimension too. The single largest majority of those elected are from the dominant Vellala community but other caste groups too have won.At least four of those elected in Jaffna are from the so called depressed castes referred to as minority Tamils or Dalits. Most of those elected have worthwhile educational qualifications. Since these castes comprise more than one-third of the total population the demand for ministerial representation is just and fair. There are also several caste groups linked to traditional maritime occupations who are quite powerful politically and want a portfolio.Another aspect to this is religion as the bulk of these caste groups are Catholics. There are Christians both Catholic and protestants in the Vellala community too. The Christians are about 20 % of the Northern population and dispersed in all five districts.Thus there is a need to a ccommodate a Christian also in the board of ministers. There is also the question of Muslims. The TNA is keen to reach out to the Muslims of the North and signed a memorandum of understanding with the Peoples Movement for Good Goverance headquartered in Kattankudi. The TNA fielded a PMGG nominee in Mannar district who lost.However in terms of the understanding with PMGG the defeated candidate Al Shaikh Abu Asmin will be appointed to one of the two bonus seats entitled to the TNA. It is expected that Abu Asmin may be made deputy chairman of the council. 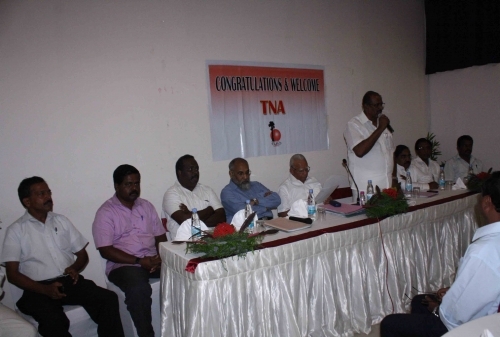 The TNA is also thinking of nominating defeated TULF president Veerasingham Anandasangaree to the other bonus seat and appoint the veteran politician as chairman. 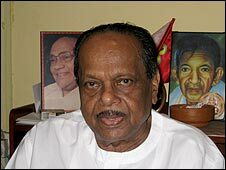 While TNA leader Sampanthan and Chief minister elect Wigneswaran are supportive of Sangaree it is being opposed bitterly by TNA parliamentarians Senathirajah and Sritharan. In a bid to prevent Anandasangaree being nominated attempts are being made to nominate ms. Mary Kamala Gunaseelan who lost in Mullaitheevu as bonus seat MP on the basis that more women representation is needed.There is only one woman elected in a council of 38 whereas women outnumber men in terms of population in the province.Ms. Gunaseelan the vice-principal of Arasaratnam Maha Vidyalayam was a nominee of the TULF n the poll. In view of these conflicting and contending demands and claims the TNA hierarchy is trying to adopt the strategy of nominating one each from the five different districts to the board of ministers and as chairman. While chief minister Wigneswaran will be regarded as common to the entire province the four ministers and chairman will be represent the five districts.It is felt that such a landscape based formula will be better than catering specifically to party, religion, caste and gender interests.While nominating on the basis of district the other different interests will also be reflected as far as possible in the appointments. There is however another problem too in decision making in this regard.The TNA fielded many retired administrators, educationists and professionals who have all been elected. This has created difficulties in deciding as several are perceived as potential ministers with equal status. The TNA has at least three medical doctors to be considered for a health minister portfolio. Likewise it has at least four retired education directors who can be education ministers. The Tamil political parties have for many decades been out of the corridors of power and so the task of sharing power in the form of a provincial administration is an unfamiliar one. It is against this backdrop that the TNA hierarchy is struggling to finalise decisions about appointing a bonus seat MP, Council chairman and four provincial ministers.The formidable assignment is expected to be over within 48 hours. « Tamil National Alliance Sweeps Northern Provincial Poll with 30 out of 38 Seats with CV Wigneswaran Polling 132,255 Preference Votes.